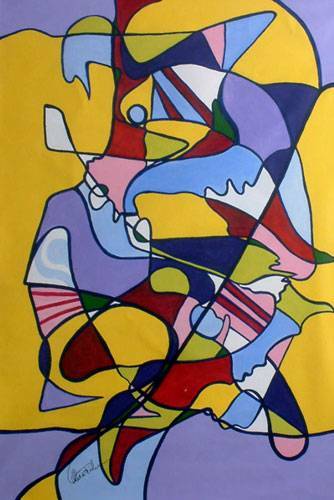 Abstract Brazilian Fine Art , "Corner"
Totally abstract, this delightful painting presents a jigsaw puzzle of forms and colors. Olivia Feder selects a palette of red, yellow, blue and violet, creating cheerful color closures. It suggests the movement of life on an afternoon street corner. "... she designs a space that offers itself like a balm, a place of repose for eyes tired of witnessing the human tragedy." "Although she uses the sea as her theme, the art of Olivia Feder breaks away from marine conventions. In these works there is a preoccupation to portray scenes relative to the surface of the sea; her paintings are destined to unveil marine landscapes, hidden in the depths. Paraded in this setting are tortoises, corals, anemones, and little fish that transcend the limits of mere representation: they are icons of the struggle for freedom of feeling and thought. "Her work is an invitation to enchantment. In agreement with her inherent romanticism, the painter sets off on a search for a utopian place, where other values reside, distanced from those of everyday life that we come across in the contemporary panorama. Putting into perspective the depths of the sea, Olivia proposes the possibility of rescuing gracious beauty, lost equilibrium, another level of consciousness. In a moment as disturbing as the one we live in, her pictorial language doesn't rely on the contusion of denouncement, nor the desire for confrontation or rupturing; instead she designs a space that offers itself like a balm, a place of repose for eyes tired of witnessing the human tragedy." Feder has participated in numerous individual and collective exhibitions in and around Rio de Janeiro.